Recently, the KBNP received great news from the ICCN headquarters in Kinshasa; its request for a new price schedule, based on a large market research study carried out last year, was approved and could be put in place immediately. 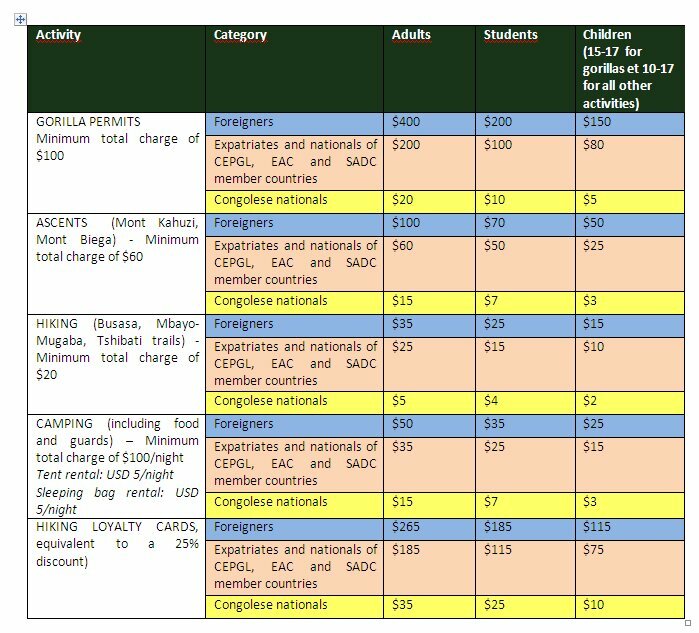 We therefore have the pleasure of presenting our new prices, which not only offer reductions for gorilla permits for Congolese nationals, expatriates and nationals of CEPGL, EAC and SADC member countries, students and children, but also attractive prices for hiking, mountain ascents and camping. In an effort to encourage people to come regularly and discover the many attractions of our park, we also offer loyalty cards for hiking. We hope to see you soon! Students: Present a valid student card. Minimum Total Charge: No activity can be offered to an individual or a group until the minimum charge has been reached. Hiking Loyalty Cards: Hiking Loyalty Cards are only valid for the trails listed under “Hiking”, as well as further trails once they have been developed. The cards are sold at the KBNP office in Bukavu and at the Tshivanga Visitor Centre. Once purchased, please present your card at the Visitor Centre before your hike to receive a stamp. 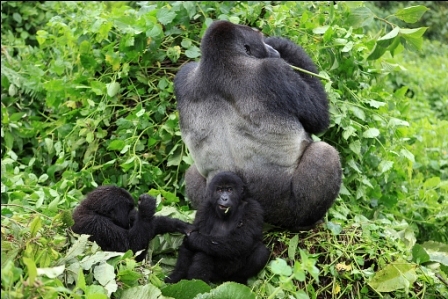 Children: aged 15 to 17 for gorilla permits, and 10 to 17 for hiking and mountain ascents. Children younger than said ages will not be permitted to participate. 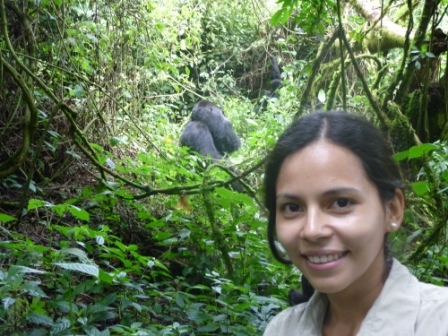 Undoubtedly the main attraction of the Kahuzi-Biega National Park, a visit to see our Grauer’s gorillas (Gorilla gorilla graueri) is a unique and unforgettable experience. These largest of gorillas can only be visited in our park, a privilege of which we are immensely proud and which we are delighted to share with the rest of the world. 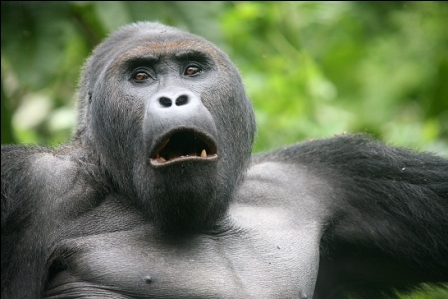 The Grauer’s gorilla is only found in eastern DRC. It is protected in the KBNP and in the Maiko National Park and is distributed between Lubutu in the North, Lubero in the North-East and Fizi in the South. The Grauer’s gorilla is the largest of all the subspecies, with males in the wild reaching weights of 250 kg and heights of 2 m when standing upright. The females are considerably smaller with a maximum weight of 110 kg and a height of 140 cm. 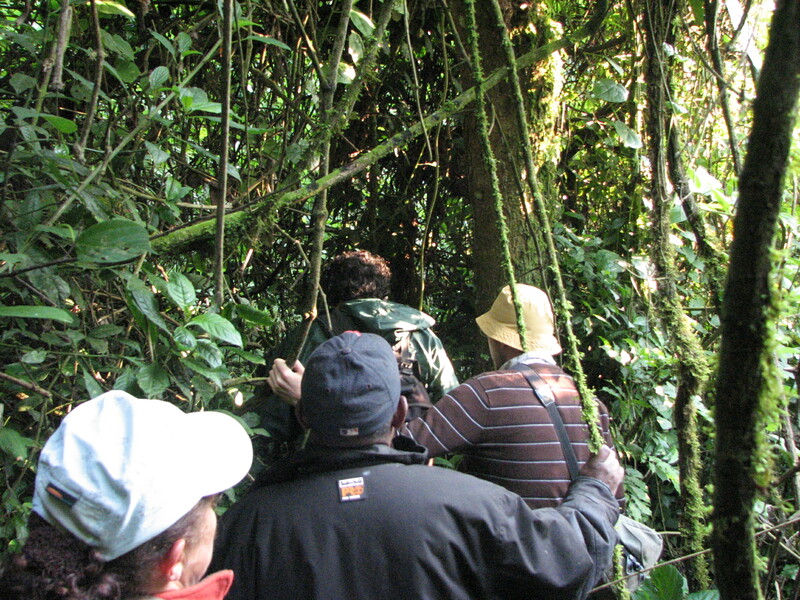 A tyical visit will start with a 1-2 hour trek through the forest (although occasionally the trek will take only a few minutes), making your way through the dense and varied vegetation, where you may come across some our other primates such as the Owl-faced Guenon, spot one our endemic birds like the colorful Ruwenzori Touraco, or stumble in the footprint of a forest elephant. that you have reached your destination. Often, the first gorilla you’ll see is one of the young keeping look-out in the trees. The next hour spent in the company of the gorillas will allow you to catch a glimpse of the gorillas going about their daily lives; feeding, playing, resting, grooming, teaching. Look closely and appreciate the different expressions on the gorillas’ faces and distinguish the various personalities of each family member. If you are with our star silverback Chimanuka, try to spot the four sets of twins, an unheard of phenomenon which has baffled and excited the world’s primatologist community. If you were not already convinced of the importance of protecting this animal, by the end of this magical hour, you will be. Please check here for our new prices. 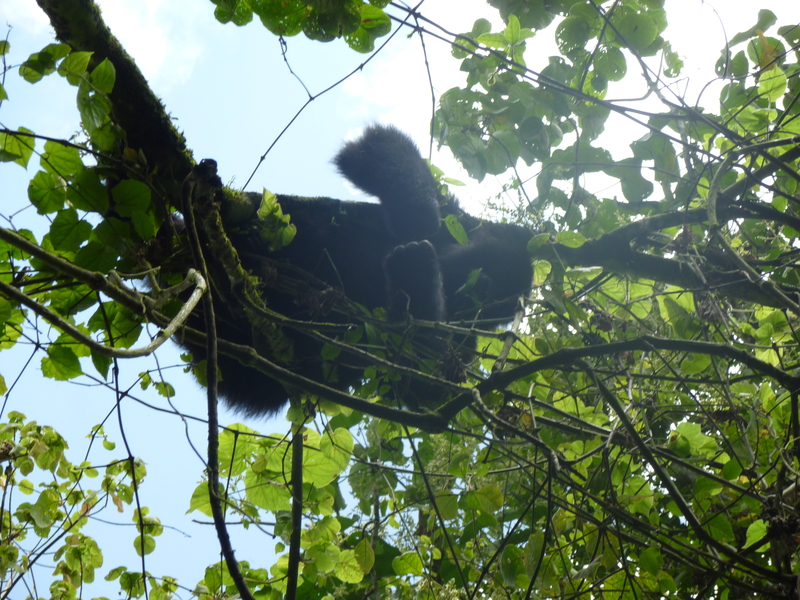 Gorilla permits can be obtained at the Visitors Centre at Tshivanga or at the ICCN Office in Bukavu (both open Monday to Friday from 8am – 4pm). Phone reservations can be made on +243 99 309 6120 (Français) or +243 99 725 4296 (English). Email reservations can be made on reservationpnkb@gmail.com. Alternatively, you can arrange your visit via a local tour operator or hotel. At Tshivanga, the entrance to the park, you must check in and pay for the visitor’s permit- Children under the age of 15 are not admitted. You are advised to bring a raincoat, boots or walking shoes and water.